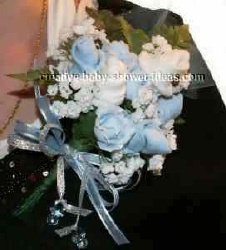 A baby corsage is a fun and beautiful way to make the mother-to-be feel special at the baby shower. This gift can also be used for other special occasions as coming home from the hospital, blessing the baby, a honorary girl's night out, meet the baby open house or just to make her feel special. Using baby socks as roses can be creative and original way to give some needed supplies to the mother. Start by rolling your socks into sock roses. For this corsage I used both the rosebud and open rose rolling techniques. Out of the 3 pairs of socks I ended up making 5 sock roses and had one sock left over. Thread each baby sock with a floral wire and cut to a length a little longer than what you will need for your corsage. Wrap with floral tape. You will not need to add individual rose leaves for the corsage. Cut your ferns and baby's breath into smaller sections to be used throughout the corsage. Wrap everything you plan on using in the corsage with floral wire. Take the tulle circle and hold it from the center to wrap with the wire. Wrap the wire around each fern, baby's breath, and silk rose. Cut it to length so it matches your sock roses. Wrap your silk flowers with floral tape to give it extra strength. Start arranging your corsage with the back layer. You will want the tulle circle to be the first item. Place one or two fern leaves on top of the tulle circle and wrap the wires together with floral tape. Then add your first sock rose. Add your sock roses layer by layer in a downward motion. Place any filler flowers like the silk roses and baby's breath in between the sock roses, stopping to wrap each new layer with the whole corsage as you go. This will help give it strength and keep any flowers from coming loose. Fill any bare spots with baby's breath and wrap the wire to the rest of the corsage with the floral tape. Your ribbons are going to try to slip off of the corsage when you tie it because there is nothing for it to "grab" onto. So I like to add a little double sided sticky tape around the stem in the place I plan on tying the ribbon. Place one ribbon on top of the other and cut both to the same length. Cut it longer than you think you will need just in case. You can always trim the excess later. Tie the ribbon as you would tie a bow on a shoe. Arrange the size of the bow to your liking and tie another bow on top of that one. Use a dab of hot glue to hold the knot together. Separate the ribbons on your bows. Trim your ribbons and tie your miniature pacifiers to 2 of the ribbons. Once you have achieved your desired look on the sock corsage, you will want to clip the wires to a length just a little longer than the corsage and wrap the bottom with floral tape to cover any pointy ends. Want a matching baby sock boutonniere? Why should you buy a sock corsage on eBay? You don't need to worry about getting burned. The seller rating speaks for itself. Great selection! Get a professionally designed corsage to match almost any theme.